How to get the best vocal recording! To get a solid vocal recording make sure you have the artist do a practice take so you can adjust the levels so there is no distortion. It is important to have them do the practice take as if they were really recording the final cut. To pick up the full sound of the voice you should have the height of the mic placed somewhere between the artists nose and mouth. 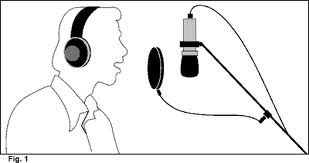 Always use a pop filter to avoid any plosive sounds that come from "P", "B" and "T" words. Never should the artists be directly up on the pop filter when recording. Have them be a few inches away. Always use compression and EQ to taste for the best possible vocal recording. Compression gives the recording that major label sound that you hear on the radio.